Pet lovers love traveling with their furry friends. Traveling by private aircraft is the best and most comfortable way to do it. Pet travel on a private jet allows your dog or cat travel in the main cabin. Pets may also be able walk around when the private jet is at cruising altitude. Pet catering is available! The rules when traveling with your cat or dog on a private jet, and other overall pet preferences, are listed in the manifests provided to the aircraft operator. Note that every situation is different and rules and recommendations vary when it comes to bringing pets on a private aircraft, so it is always best to check in advance to avoid any confusion before you are set to travel. There may be restrictions that go beyond what operators to the owners of each aircraft can offer. In many cases, operators will seek the aircraft that will take the pet and give you the choices you seek for pet travel. Up-to-date vaccinations and customs documentation. Get your pet’s paperwork in order. Talk to your private jet charter company and find out about requirements for the destination; some places have strict quarantine restrictions. Leash for travel. Many jets require that your pet remain on a leash at all times to and from the aircraft, on the ground. Make sure you have weight-appropriate leashes. Body harnesses are the best option to secure larger pets and are proven to be the best way to restrain them if there is turbulence and for a safe takeoff and landing. Pet carriers. Small dogs and cats travel safely in a carrier. The carrier can be affixed to a seat belt during takeoff and landing. Request treats in advance. 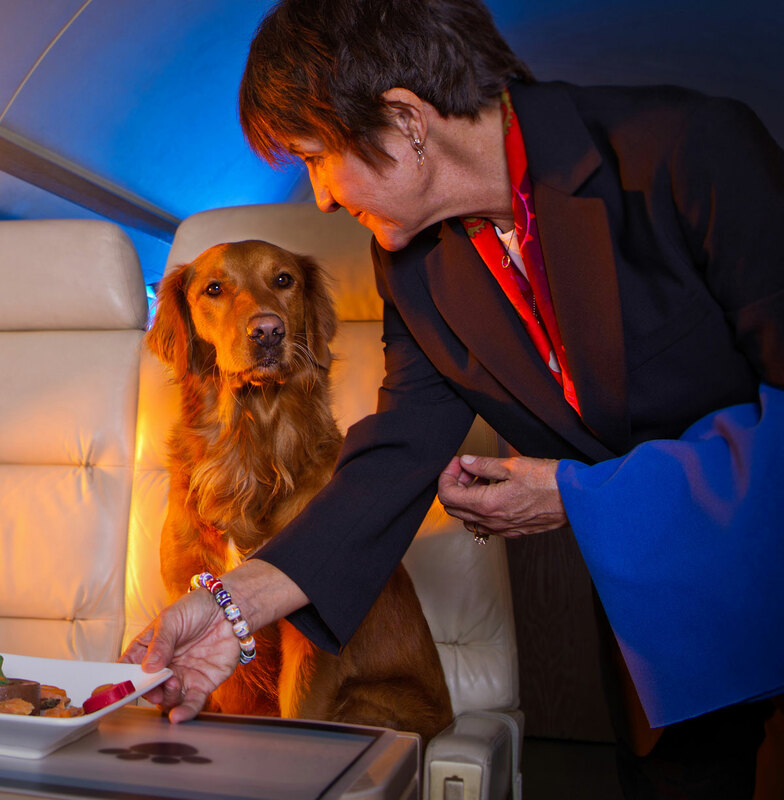 You can request that your private jet operator arrange to have treats or pet food for your convenience, or pack the treats yourself. If you are the owner of multiple pets, private jet is perfect for travel. Usually, there are no additional fees, so that is yet another major benefit over commercial aircraft. Also, some private aircraft owners may want an aircraft to be cleaned afterward. Traveling with your pet is simple. It’s a matter of communicating with your private aviation charter company about their latest guidelines and requirements. The proper arrangements can be made in advance to ensure the best flight. For example, ABI arranges paperwork and often provides pet catering services to their pet loving clients. Being fully prepared with documentation and the right equipment for the journey will ensure the best experience possible. Do you have any additional tips to add about pet travel? We’d love to hear them!